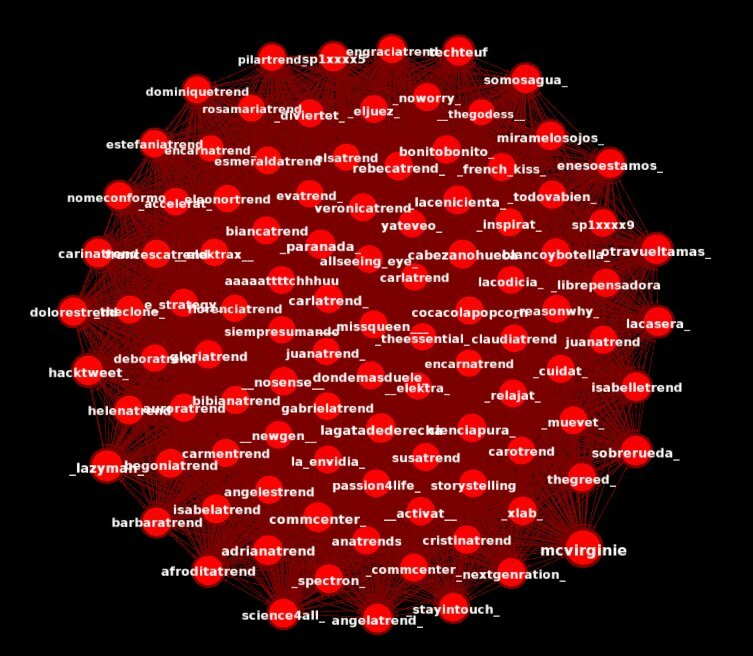 Researchers uncovered a propaganda network that spewed more than 41,000 tweets about Spanish rulers and politics. The botnet was run by professionals. The researchers noticed this at once. 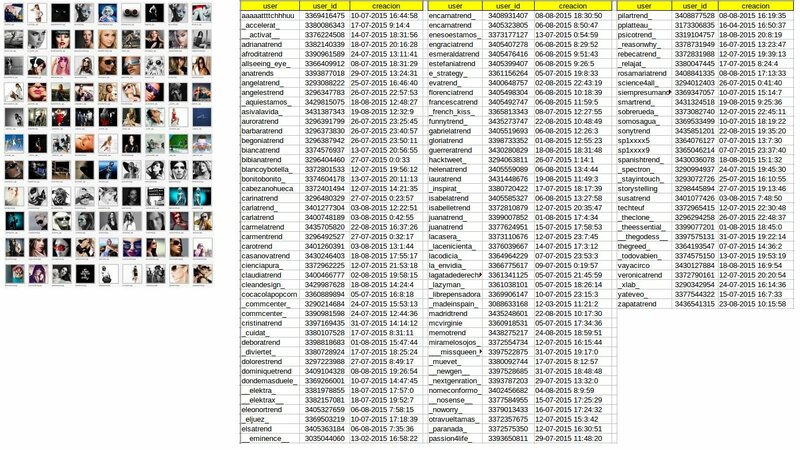 One real account, supported by two assistants, controlled more than a hundred bogus Twitter profiles. In less than two months the propaganda network spewed upwards of 41,000 tweets. Their goal? Support a political party, a newspaper, and a country's royal house. Twitter is awash in government propaganda. The social media platform has become the most important political forum on the planet. But while Twitter gives everyone a voice, it also gives anyone with the right tools (and a desire to cheat) the ability to automate an army of bots, and thus a megaphone to drown out honest users. A group of researchers in Spain is fed up. They taught themselves Python and learned how to use Twitter's API so they could fight back against this trend. "This conduct is morally unacceptable," they wrote on their blog. "It's scamming the people and we must not permit it." The researchers' latest bust, according to their blog post here, tracks a propaganda network from its inception in July of this year until exposure at the end of August. 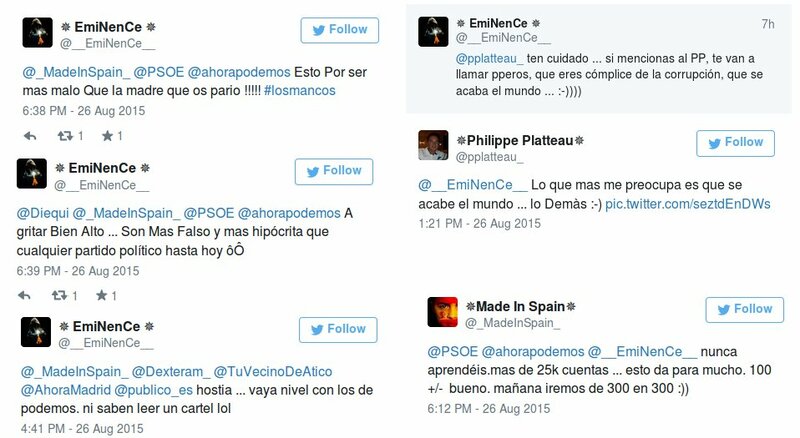 The controlling account, @pplatteau_, camouflaged the Spanish political propaganda under cover of English-language tweets related to technology, which, according to the researchers, accounted for more than 60 percent of the user's tweets during the two months in question. The two assistants, @_madeinspain_ and @__eminence__, retweeted propaganda that promoted Spanish newspaper La Razón, Spanish political party Partido Popular (the People's Party), and the Spanish royal house. The rest of the botnet followed suit, retweeting and favoriting the propaganda. After the researchers published their findings on August 26, 2015, the three real accounts were dismissive, one going so far as to say "You never learn. More than 35k accounts...that gives you a lot. 100 +/- is fine. Tomorrow we'll go for 300 more :))." The researchers publish anonymously, and did not wish to identify themselves to Motherboard. "Due to the kind of work we are doing we prefer to remain in anonymity," they wrote in Spanish in an unencrypted email. "We will tell you that we do not belong to the social media world and neither do we have any kind of relationship with the political world." They also expressed frustration at Twitter's reluctance to do anything about political spam. "Twitter doesn't seem to have any interest in avoiding political spam," they added, "and only appears to act by suspending the accounts with fake profiles...when they have no other choice because of the news." Twitter refused to comment, writing in an email, "We do not have a comment for your story."